With listen, you can have your articles in Pocket read out loud. This is perfect for those times when you’re doing chores around the house or driving during your commute, when your eyes and hands are busy. 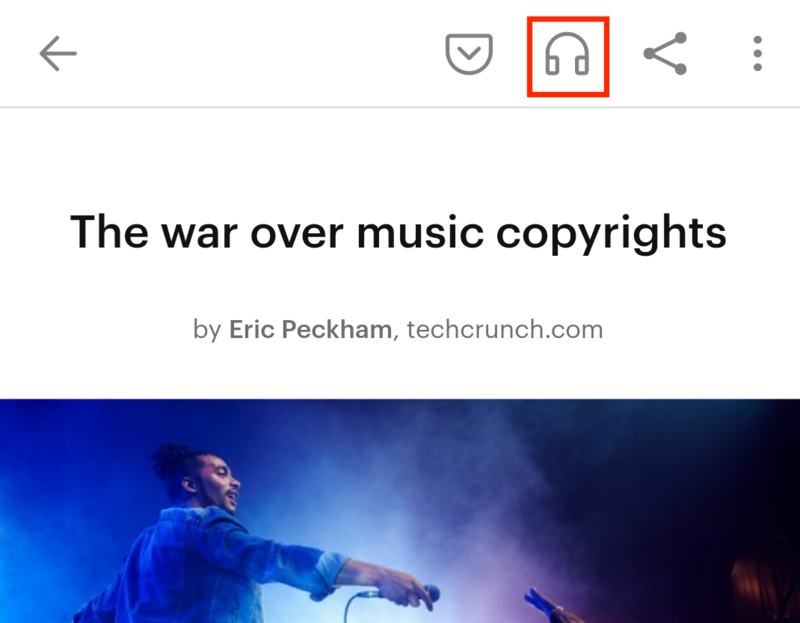 When you press listen, Pocket will read the article back to you as if you were streaming a song on a music app (like Spotify or Apple Music). For Android users, listen is also available offline using your device’s text-to-speech capabilities. 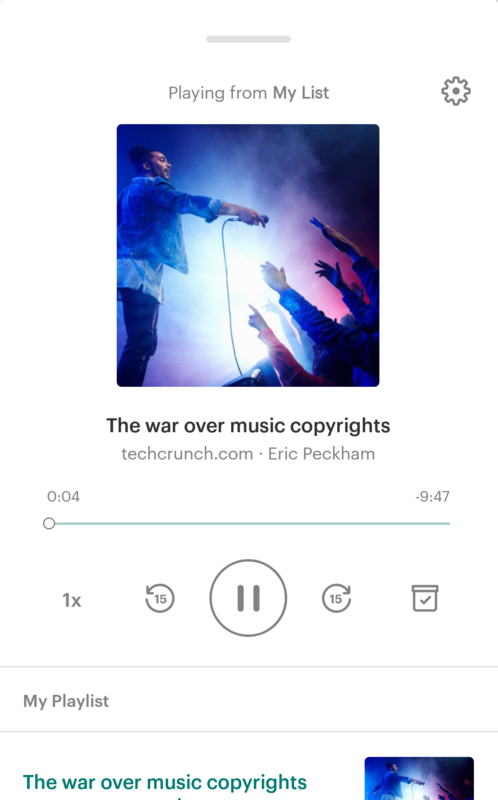 Continue reading to learn how to use listen in Pocket on iOS and Android, with Amazon Alexa, and as a bonus, how to listen to articles on your computer as well. When you open your List, you'll see a headphones button in the toolbar. 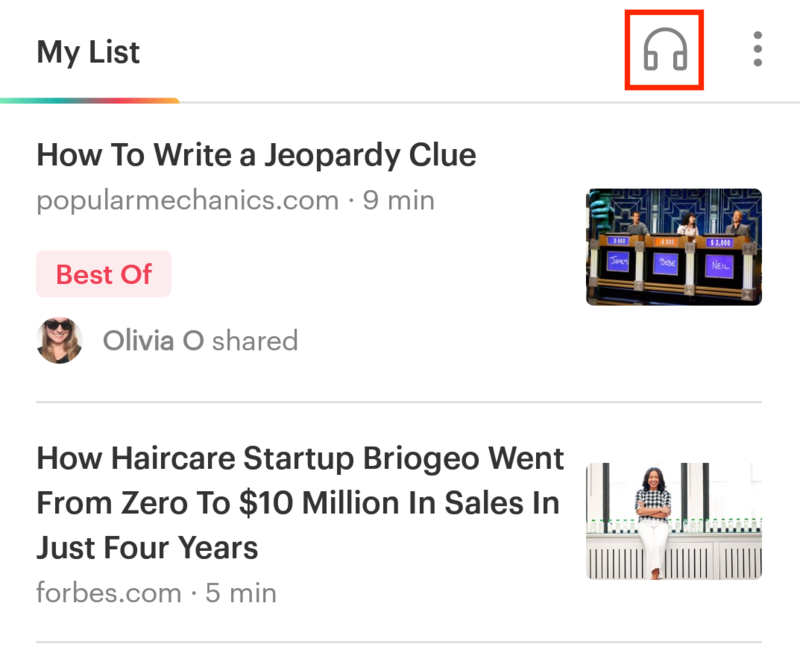 Tap this button to launch listen, and tap the Play button to start listening to the first article at the top of your List. Or, scroll down to choose a different article from your playlist. Open an article and tap the headphones button. 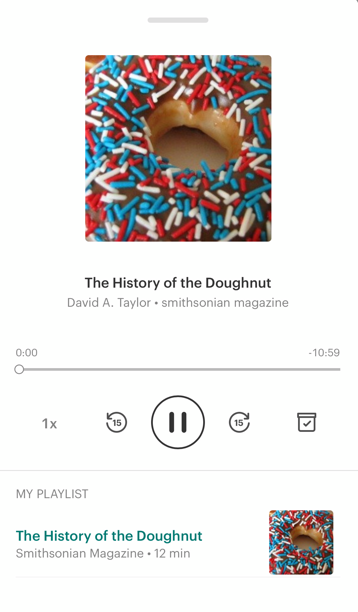 The listen menu will appear, and the article will begin playing immediately. To stop listening, swipe down on the listen screen until it disappears. Note: You can use Listen on iPhone and iPad when you’re connected to the Internet. Listen is not available offline in Pocket for iOS at this time. 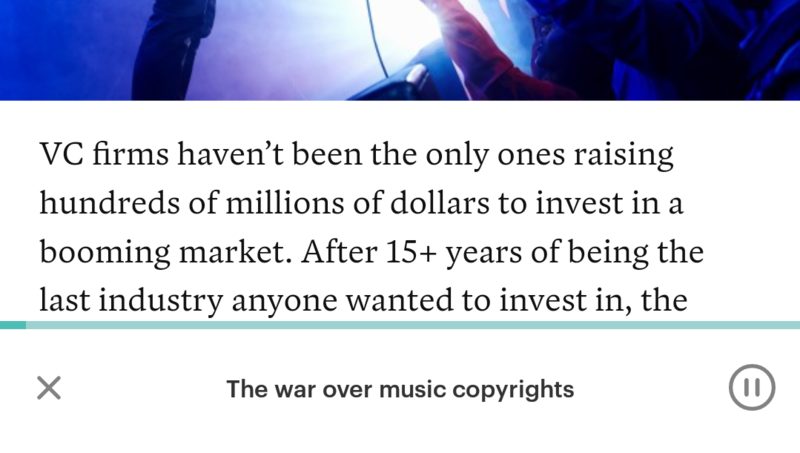 You can also start listening to an article when you're viewing it in Article View. 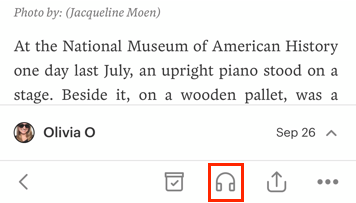 To do so, open an article in Article View, then tap the headphones button in the top-right corner to start listening automatically. Stream best-quality voices - When this option is enabled, Pocket will use server-generated voices. If this option is disabled, Pocket will use the text-to-speech processing function on your device. 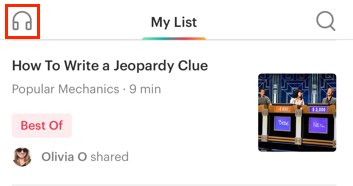 Auto Play - If enabled, Pocket will automatically play the next article in your playlist. Turn this off to Listen to articles one at a time. Automatic Archiving - If enabled, articles that you listen to completely will be Archived automatically. When you’re online, you’ll have access to streamable voice options. When you’re offline, you can use voice options that have been downloaded to your device. Tap your preferred voice option to select it. Note that voice options with the cloud icon are only available when you’re online. You can listen to articles in Pocket on your Echo and Alexa-enabled devices. Simply install the Pocket Skill to get started. Click here to learn more about listening to articles in Pocket with Amazon Alexa. If you’re using the Firefox browser, you can listen to articles using the text-to-speech feature in Firefox Reader View. Click here to learn how to listen to articles in Firefox using Firefox Reader View. Right-click (or Command+click) the highlighted text, and navigate to Speech > Start Speaking. You can also go to the Edit > Speech > Start Speaking. The Listen (TTS) option seems to be missing for me. What can I do? Listen (TTS) is available for articles. If an item you’ve saved to Pocket is not an article and shown in Web View, the listen option will not be shown. Why am I unable to listen to certain articles? We don’t identify the saved link as an article. The page may not be an article, such as a recipe, index page, or another type of webpage. Pocket may not be correctly identifying the page as an article. If you’re using Pocket on iOS, the article may be in a language we don’t support. Please see the languages listed below to see which are currently supported by Pocket. The article may be behind a paywall. If a website has a paywall which limits access to subscribers, listening will unfortunately not be possible at this time. If you discover an article that you’re not able to listen to in Pocket, we’re happy to look into it! Click here to contact Pocket Support and let us know. Which languages are supported by the listen feature in Pocket? 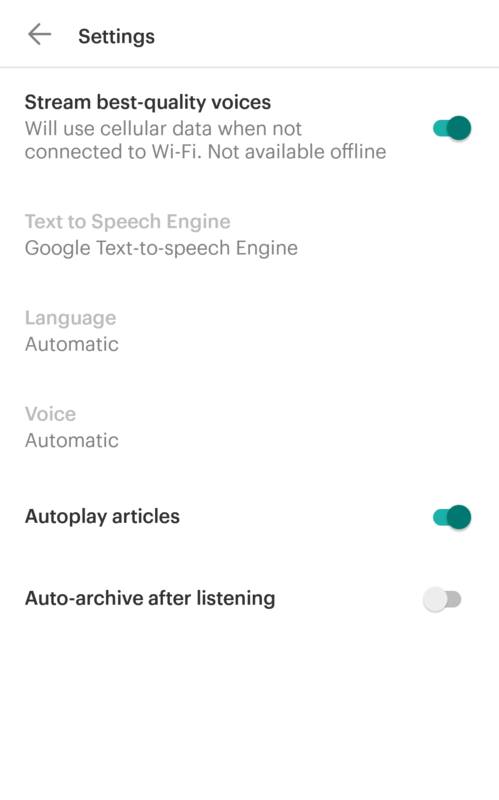 If you use Pocket for Android, you can listen to articles in additional voices by disabling the high quality voices and switch to your device’s text-to-speech processing. Instructions are included above. Click here to view them. We’re working to expand the number of voice options in upcoming releases. If you’d like to listen in additional languages in Pocket, please click here to let us know.